Like many others in my generation, I grew up playing games. That's nothing special, really. However, I did grow up in Saguenay, QuÃ©bec. Saguenay is most well known for its blueberries, cool Native American names like Chicoutimi or Shipshaw, its aluminum smelters, green spaces and close to an 80 degrees Celsius difference between the coldest days of the winter and the warmest of summer. I should also point out that it is home to North America's only fjord - we're quite proud of that fact. All in all, it's a great place to live, grow up and play games. Games in the English-language, that is. Before cable TV became a commodity, a Saguenay boy's only means of learning English by himself was listening to American music or speaking to Anglophones. There was little interest for the former in our house at the time, and there's one thing Saguenay's not known for: its Anglophone population. With no benevolent Anglophones anywhere nearby, I could not have learned English to save my life. Growing up as a francophone gamer in an overwhelmingly Anglophone gaming world, however, taught me two things. The first is English, the language. The second thing is that localization, which is intended to help French-Canadian boys like me, among others, enjoy the games originally written in English (or Japanese), can also act as an obstacle between a gamer and his hobby. My home town, St-Ambroise, is a picture-perfect example of Saguenay's almost complete uni-lingualism. According to the Institut de la Statistique du QuÃ©bec, 0.4 percent of St-Ambroise's 3,605 inhabitants were Anglophones in 1996. That's 10 people, although I strongly suspect these numbers include a dog or two that bark instead of aboyer. As of 2006, the town is home to 3,475 people, again with 10 inhabitants who only speak English. Aside from those 10 souls, not a lot of us SaguenÃ©ens were bilingual when I was a wee boy. And by bilingual, I mean someone who can read the back of a shampoo bottle and not sound like a brain damaged CÃ©line Dion, at best, and like a heavily drugged Jean ChrÃ©tien, at worst. For the better part of my early years, this wasn't a problem. I was happy playing games in English for one good reason: they were, for the most part, text-free. Atari games were a piece of cake, as were most of the early NES games. The words "Press Start" flashed on the screen and there was a "Start" button on the controller; mental connections were made. Let there be game. Things changed, however, when fate put the first Final Fantasy in my NES console. That was in 1990, I was 10, still in Saguenay and still almost completely and unbearably unilingual. Thankfully, francophone students all over QuÃ©bec started taking English lessons in 4th grade, which I had started that term. This meant that I had a new best friend at my disposal: a mandatory, pocket-sized and soon-to-be-abused bilingual dictionary. The book was a double-edged sword, however: both the savior of my gaming and the bane of my social life. 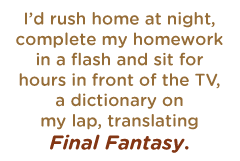 I'd rush home at night, complete my homework in a flash and sit for hours in front of the TV, a dictionary on my lap, translating Final Fantasy so that I could complete the game and understand what terrible events were unfolding. My (unilingual) dad would sit on the couch and watch me play, oblivious to what was attracting me to the slow-paced, text-filled game. "Maudit que t'es plate," he'd say. Literally: "Damn, you're boring."